JUPITER, Fla. — Police received an emergency call at about 5:30 a.m. from a person who thought that the CITGO service station at 2508 Indiantown Road was being robbed. A woman who was pumping gas told police she was confronted by a man waving a knife. She was able to get away. A short time later police received a second call. Police say a man was withdrawing money from a Wachovia Bank ATM near the CITGO when he was confronted, stabbed and robbed. The suspect left on a green bicycle. Police found it in the Limestone Creek area. Police suspect the crimes were committed by the same man. “It’s a concern when you have somebody who is willing to commit a violent felony of this nature. But our investigators are doing…diligent to locate the suspect. We provide high visibility patrol every day. You know we have adequate units out there to provide such patrol and sense of security for our neighbors,” said Sgt. Scott Pascarella of the Jupiter Police Department. The stabbing victim’s injuries were not life-threatening. 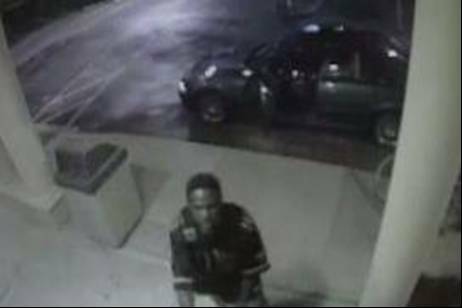 The suspect is described as a black man in his 40s or 50, about 5’10” and 180 lbs. He has a scruffy beard and was wearing a black football jersey with white numbers and blue jean shorts.